It's been quite a week for Second Life press! The press archive page has been updated with more Second Life press coverage, and below are some highlights from the week. Viewer 2 launched in beta on Tuesday, with some great press attention. One of my favorite pieces was Robert Scoble's video interview with M Linden, which you can watch over at Building 43. Robert took the time to visit the Lab on Battery Street here in San Francisco last Friday to film the interview, and he and M had a great conversation. Mitch Wagner (aka the Copper Robot) also published a thoughtful review of Viewer 2 (and a follow-up) for Computerworld after having interviewed T Linden inworld. There's so much more good stuff on this topic - including great posts from well-known Second Life bloggers, so please do check out the archive for more. Next week, you can check out Amanda Linden and Esbee Linden on Wednesday's episode of Metanomics, where they'll be talking more about Viewer 2 and the beta launch. If you're following @SLBallyhoo on Twitter, you may already seen a great CNN Money segment about Second Life DJ Doubledown Tandino as part of their 'Best Job's series. Congratulations on the great coverage, Doubledown! Buddhist magazine the Shambhala Sun carried an article sharing one Buddhist's experience exploring Second Life. In it, the author (pictured right, from the site) writes that he joined a discussion with about 20 other avatars and says, "For me this was great: I hadn’t met many Buddhists in the real world so it had been hard to discuss things I was curious about." This gets at one of the great things about Second Life - the opportunity to connect with (and learn from) others in a meaningful way that you may not have the chance to in the physical world. Not Second Life-specific, but interesting nonetheless: this week, the AFP covered research from Stanford University's Virtual Human Interaction Lab, exploring the impact that having an avatar can have on the rest of our lives. You can find the AFP piece over at France24, and check out Stanford University News' coverage of it as well. Also this week, Ethical Corporation published a post about a new book called The Responsibility Revolution, which will be released on March 15. Linden Lab is among the companies profiled in the book, and some of our internal tools like the Love Machine are presented. As always, check out the press archive and follow @SLBallyhoo on Twitter for more Second Life coverage highlights - there's more coming! Let's say you are a blogger who writes about music regularly and includes links to music in your posts. How do you avoid having your blog censored off the Internet by "DMCA takedown notices" sent out by music industry lawyers (as happened last week to several blogs hosted by Blogger)? Of course, you could get authorization from all the relevant copyright owners before you post or link to a song. Unfortunately, that's virtually impossible for many music bloggers. In some cases, it may be impossible to figure out who the copyright owners are (consider the problem of live concert bootlegs, rare B-sides, out-of-print material, defunct labels). In other cases, you might have authorization from someone, but it could end up being the wrong person (i.e., an independent promoter or member of the band who doesn't actually have all the rights to give you). And even if you get authorization from all the right people, you could still find yourself on the receiving end of a DMCA takedown from the entity that controls the copyright in another country (because your blog can be accessed from that country). In other words, it's quite likely that many music bloggers can never be sure that a DMCA takedown notice won't arrive someday. If one does arrive, your blog hosting service probably won't take your side. The law gives online hosting services strong incentives to comply with takedown notices—prompt responses to takedown notices are often the only reliable shield that hosting services have against copyright infringement lawsuits and potentially hundreds of thousands of dollars of damages. No matter how much your hosting service values your business, it is not likely that they will be willing to bet their business to save your blog. While most hosting providers will let you send a "DMCA counter-notice" to contest a bogus takedown notice, sending a counter-notice can have serious consequences if you're not absolutely sure that you had all the necessary legal rights to post the songs or links in question. Sending a DMCA counter-notice is serious business, as it leaves the copyright owner with few options (other than suing) in order to keep the song down. So we recommend that bloggers research copyright law and, if in doubt, consult a qualified attorney (or contact EFF) before sending DMCA counter-notices. The DMCA also gives hosting services strong incentives to "terminate repeat infringers." That's why most blog hosting services will delete your account (and thus your entire blog) after receiving multiple DMCA takedown notices. The industry norm seems to be a "3 strikes" policy, although the number of "strikes" can vary. This policy can be particularly unfair when a copyright owner sends multiple DMCA takedown notices all at once, or within a few days of each other — you can find your blog deleted before you even find out who was complaining or can send a DMCA counter-notice. Many hosting providers also mark every DMCA takedown notice on your "permanent record" — simply deleting the file or the link won't expunge the "strike" on your account (generally, only a DMCA counter-notice will do that). So a DMCA takedown notice received for your blog might still count as a "strike" years later (again, this is because service providers want to be able to tell a court that they were good about "terminating repeat infringers," lest they lose their shield against copyright infringement lawsuits). Of course, you may be able to talk the copyright owner into withdrawing a DMCA notice ("your marketing department sent me an email saying this link was legit"). And there may be informal strategies that work most of the time (like deleting links after a short period of time). However, at the end of the day, it's nearly impossible to be sure you'll never receive a DMCA takedown notice. That's right! I, Brad Reason, am giving away my new 2010 album release "Multiple Worlds." The new album is currently not released and not available to the public. Over the past few years, I have been performing live into the virtual world known as Second Life under the name Doubledown Tandino. Through my experiences and exploration inworld, I have created instrumental electronic music inspired by this immersive environment. 14 original tracks by Brad Reason (with one collaboration track by Slim Girl Fat). The music styles include eclectic electronica, nujazz breakbeat, house, drum-n-bass, intelligent dance music, avant-garde, & experimental. The contest is simple: Listen to my tunes at http://reverbnation.com/BradReason The FIVE people that listen to the most tunes between now and March 15th will receive the digital album release "Multiple Worlds" for FREE. The album comes in digital MP3 format and will be delivered straight to your email inbox. FIVE people will receive my unreleased new album for free simply by listening to music. Pitch auto-correction and a simple beat can make anything chart-worthy; even a freestyle about guacamole and expired milk. Below, is the tutorial on how to create a piece of "music" using AutoTune. Spoiler alert: If you watch this tutorial and use autotune for creating your music, not only will your artistic integrity be sucked out of your immortal soul within seconds, but also a cute puppy dies. I posted this video, to simply show the educational value... but I highly advise against actually creating your own music this way. People... autotune... it's pathetic. It sounds like trash, and it provides the key for listeners to instantly know you have no imagination or talent whatsoever. Don't do it... remember, puppies die. A million ideas. And they used every single one of them. The SL Shakespeare Company (SLSC) today has finalized its name change process, and will now officially be known as The Metaverse Shakespeare Company (MSC). In the upcoming months, it is our pleasure to take a more active role in encouraging the arts inside of Second Life. We are excited to announce the creation of a Linden Endowment for the Arts (LEA) program which will help support, encourage, and highlight Second Life artists and their work. We hope that the collaboration between Linden Lab and the wealth of talented Second Life artists will contribute to a vibrant new chapter for the arts in Second Life. To provide a new way for artwork to live on within our ever-changing virtual world. While still under design, this program will be a partnership between Linden Lab and Second Life artists, with the additional objective of gathering, displaying, and maintaining art at an inworld Arts Hub. We are currently building the LEA organizing committee, which will include members of the Second Life artist community and Linden Lab employees, to guide the program's management. Under the creative direction, organization and guidance of the LEA committee, we will hold biannual art exhibitions, highlighting the most creative artwork happening inworld. Whether you're interested in joining the committee or simply have a useful suggestion to share, don't be shy—go ahead and submit a LEA Committee Application or post your suggestions below. We are looking for a small but dedicated group of individuals who are willing to make an ongoing time commitment to this program. Got other thoughts? Post 'em below! We can't wait to start working with the arts community on this tremendous endeavor. Stay tuned to the Community Blog as more information becomes available! The interview I did with CNN is RELEASED!! What a great job CNN and reporter Matthew Leung did putting the interview together! Also mentioned on Dusan Writer's Metaverse! Thank you Dusan! Also mentioned on Association of Virtual Worlds! Thank you Edita! Also mentioned on Ed Clarity's Blog! Thank you Ed! POLL: What do you think of the new Second Life 2.0 Viewer? Please, post your opinions in comments. What are the pros to the new 2.0 SL viewer? What are the cons? Is the new 2.0 viewer going to be a workable viewer for all Second Life residents, old and new? What do we gain from the new viewer? Is it easier to use and find things? What is the new viewer lacking that is needed, and can only be found in the old viewer? I would love to hear all perspectives and usage commentary on the new Second Life 2.0 viewer. Ready to Try Viewer 2? Feedback We want your feedback. Join the Viewer 2 Beta Forums or submit a PJIRA. There are brand new fresh Widgets provided by ReverbNation! I use ReverbNation widgets and you should too! If you're a musician, you can log in (or join) Reverb Nation, and add these new music players, video players, fan collector boxes. Or, if you're a fan, and want to display your favorite music on your site or blog, check out these new widgets too. Highly recommended. James Cameron's epic tells the story a baby given a adult/baby hybrid body, which he must pilot to learn the ways of the grown-up world. Is the *Avatar* concept really possible? Is the 'Avatar' concept really possible? (CNN) -- Now the highest-grossing film ever, "Avatar," has captivated millions of viewers with its picturesque scenery, extraterrestrial battles, and nature-loving, blue-skinned aliens. The premise of the film is that humans can enter the world of these 10-foot aliens, called the Na'vi, by way of half-human, half-Na'vi hybrids. A high-tech interfacing mechanism allows a human to remain inert while controlling one of these avatar hybrids just by thinking. Not only does the human manipulate the avatar's movements and speech, but he or she also experiences life -- every sensation, feeling and emotion -- through the eyes of the hybrid, as if consciousness were transferred. Scientists say we are many decades, even centuries, away from making this kind of sophisticated interaction possible, if it can be done at all. But the fundamentals of components required to create this complicated system of mind-controlled avatars are already in the works, and have useful applications in medicine. "We're starting to understand the basic building blocks, but the biggest challenges will be emotion and thought -- how to make another organism think what you think, to feel what you feel -- because those networks are much more difficult to sort out," said Dr. Brian Litt, associate professor of neurology and bioengineering at the University of Pennsylvania. The DJ List is a DJ ranking site that's been around for a long time. It's a site devoted to ranking the popularity of DJs based on votes. Needless to say, the general population of club goers around the world fall for the "DJ superstar" image usually, and don't always understand or appreciate what it actually means to be a good DJ spinning good music (hence: Tiesto is always ranked #1). I figure, lets team up and vote for each other. The Second Life DJs and Second Life DJ fans should team up and vote for each other on the site. There's a slew of fresh, modern, innovative DJs in Second Life right now. There's also a massive handful of dedicated DJ listeners and followers inworld. Lets tap into our collective, and vote up Second Life DJs listed on TheDJList.com! * If you're a fan of a DJ in Second Life that's listed on the site, post their link in comments. * If you're not listed on TheDJList, join the site, grab yourself a DJ page, and post your link in comments. I will update this post (or perhaps create a new post every so often) with the DJ's badges that are added to the comments of this post. To vote for a DJ on TheDJList, just visit the DJ's page after you've signed into the site. I will make sure I vote for every Second Life DJ that has a TheDJList page, and I encourage everyone else from Second Life to continually vote up the Second Life DJs. I'm just pointing out AvatarsUnited.com. It's not that I especially like the site. Whether it is owned by Linden Lab now, or how it was before, it's just another social networking site in the long line of social networking sites. The influx of Second Life users to dabble on the site and use the SL Blip HUD inworld is astounding though. ...and that's what makes a social network thrive. Right now, AvatarsUnited is hopping. Whether we find use out of it remains to be seen. Facebook has stood firm declaring all users need to be their real life personae, and not Second Life avatars, or else they will delete your FB account... so perhaps AvatarsUnited.com is a fresh start on a social network new media site for avatars. I do hate the buy-coins scam section though. LL needs to remove that from the equation of the site to have it gain any future credibility. I have started the non-group "What the Hell are We Doing Here" on the site. You are welcome to join it. In a move that will no doubt perplex, flummox and befuddle many media commentators and technology columnists who erroneously believed that Second Life was a Web 2.0 social networking tool, Linden Lab has acquired social networking site, Avatars United (and developers of same, Enemy Unknown AB). This also has the side-effect of shooting down any semblance of Wallace Linden's identity piece last week being an overture of a conversation, instead making it look like the usual introduction to a Linden Lab fait accompli. 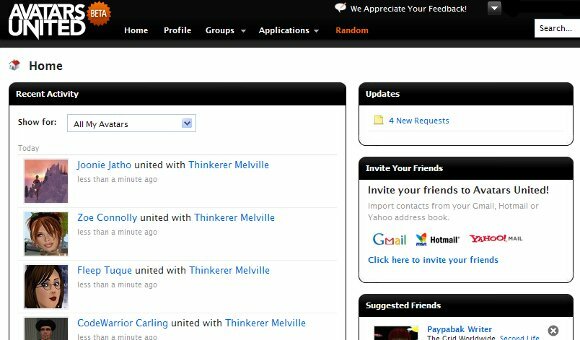 We've written about Avatars United on a couple of previous occasions, but never really had much call to get involved ourselves. Brad Reason, also known as Doubledown Tandino in Second Life® and other virtual communities, recently shared how the Internet helped him get his start, and how social media has advanced his career. Besides being an accomplished musician and DJ, Brad Reason is uniquely positioned to comment on social media’s usefulness and efficacy. Not only does he create, perform and DJ virtually live music, Brad’s also a new media marketing professional. In fact, he’s a full time social media, new media, and trending technology specialist. Since he spends 40 to 70 hours a week working with social media platforms, his experience and insights are sure to help other musicians make use of today’s most compelling promotional tools. Brad began his music career over a decade ago. “At first, it was more about using my computer and sampling, than about creating music,” he said. “It was for my own personal enjoyment, and the intrigue.” Creating music with a personal computer was in its infancy. Brad started with a program called Impulse Tracker, which was a basic spreadsheet form of laying out sounds and samples. “As I was creating my first music,” Brad recalled, “the Internet was starting to blossom as well.” He started connecting with other PC musicians via forums and message boards. “Thanks to the Internet, we could share each other’s tunes, and swap samples–it was experimental, and avant-garde,” he recollected. He was learning and growing by listening to other people’s music, and picking up tips and techniques from his virtual peers. Heavily into electronica at the time, Brad was influenced by Aphex Twin, Prodigy, Chemical Brothers, and Air among others. He began to appreciate he was on the cusp of something big because not only were the people around him beginning to listen to his tunes, there was a growing online community of other artists also experimenting. Even though MP3.com got into a legal tangle and is no more, we all know the concept stuck. Brad said he now uses sites like ReverbNation.com/BradReason and TheSixtyOne.com/Doubledown to share and sell his music. “New technology, new equipment, and new software followed–such as, ACID, Reason, Cubase, Protools, Ableton Live, Serato Scratch, and Native Instruments–and now,” he said “the possibilities for music making are limitless.” And so are the ways to connect with an audience. Brad finds social media so successful, he now limits his use of other promotional tools. In the past, he used fliers, print media, and press releases, as well as posting event info at non-social media based Web sites. “Now, because I am very skilled at using social media to market, advertise, and promote, I use social media fully, and have no need to focus on print anymore.” Social media in tandem with CDs and business cards, with the occasional flier is all he needs now. Brad’s music career began and continues to flourish entwined with computer and Internet technology. He keenly demonstrates social media is really about leveraging technology to connect, network, share, perform, promote, and learn. But most importantly, Brad Reason shows discipline with these social media platforms is worth the effort! "Nice article about music and social media: Virtually Live Music IS Social Media! Teddi Davis, editor of Free Play Virtually Live, interviews Brad Reason, a new media marketing professional who is also a musician and DJ. The article shares experience and insights on how to use the newly available online promotional tools."